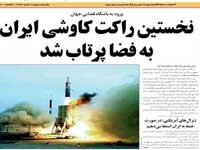 Iran has launched a rocket into orbit carrying what state-owned Al-Alam televison reports as an "experimental capsule". The official Islamic Republic News Agency said the "home-built" Kavoshgar-3, or Explorer-3 rocket was launched at a ceremony to commemorate this month's anniversary of the 1979 Islamic Revolution that overthrew Iran's monarchy. The rocket is reportedly carrying a capsule with live animals including a rat, turtles and worms. The state television said the rocket launched Wednesday was "designed to send consecutive aerial images to ground and measure environmental information." Press TV quoted Iranian space officials saying live video transmission and telemetry would allow further studies on the rat -- named Helmz-1 -- turtles and worms during their space voyage. It was not clear whether the creatures will return to Earth. President Ahmadinejad praised the launch of the satellite and the progress his country was making in its space programme.